I must admit I have stewed for a few months as to which direction I would go with a blog and I always came back to starting it out this way and with this book. 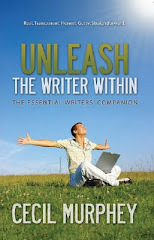 Unleash the writer within, by Cecil Murphey was the first book that I read on the art of writing and I really enjoyed reading it and felt it was set up in an easy and understandable format, in other words short and sweet! You see, I have been out of the writing scene for about five years. The silent years I call them of stepping away from a lot of things. Taking some time to rest spiritually, emotionally and physically. But something in my heart has been quietly nudging me to start writing again and the words "There is healing in the writing" were impressed upon me. I realize that I have been waiting until I felt 100% confidence in myself and that everything should be perfect in my life, but when will that ever happen? Probably not this side of heaven . I'm human...you're human. What is an Aphorism ? I must tell you I had to look that one up myself. Here is the best definition that I felt applies to how they are used in Cecil's book. Aphorism - a statement that makes a profound point in a simple, easily remembered way. Like a quote. At the end of each chapter is an Aphorism. There are twenty seven chapters and twenty seven Aphorism, one for each chapter. Tomorrow we will start with Chapter one. From one new blogger to another - welcome to blogland, Terilynn! I love your idea of following the chapters in Mr. Murphey's book and look forward to reading what you have to say each time. Blessings to you! Thankyou my fellow blogger. May we both continue to grow and enjoy the journey!